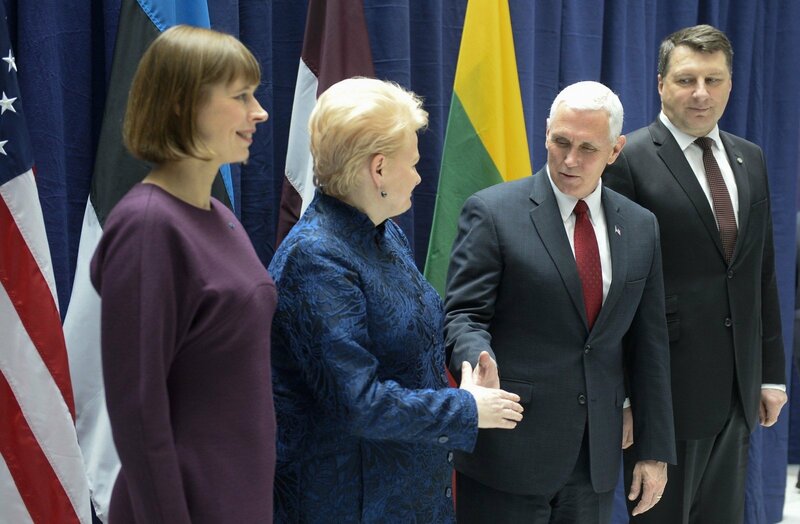 Lithuania's President Dalia Grybauskaitė says she updated US Vice-President Mike Pence on the expectations in connection to addition US military instruments to ensure air defence of the Baltic states. The US vice-president, in his turn, said he reassured the Lithuanian, Latvian and Estonian presidents on the US commitments to the Baltic security. Grybauskaitė said that, at the meeting in Munich, she presented her stance on the need to speed up the NATO decision-making process and raised the issue of US direct participation in the efforts to guarantee air defence of the Baltic states. In her words, the decisions taken during the NATO summit in Warsaw last year on additional NATO capacities in Eastern Europe are no longer enough. "I spoke very specifically about what we expect from NATO. We see that the Warsaw decisions are no longer sufficient. (…) It is also crucial to consider that NATO and US forces are largely focused in Western Europe rather than the riskiest Eastern borders," the Lithuanian president said in a telephone interview to BNS from Munich. Grybauskaitė said that maps were presented at the meeting, portraying how the architecture of the Baltic air defence could look like. "Without air defense systems of the United States, we will not be able to ensure full contingency. For now we intend to purchase some of the measures ourselves, however, direct US participation is necessary. We presented our position," she noted. "We had brought along materials, maps and truly hope that our message went through and will be accepted as a positive proposal, which NATO and the United States need," the president told BNS. Baltic officials have long said that air defense was one of the weakest links of the three nations in military terms. In an effort to consolidate it, the countries are considering broader commitments to the Allied fighter-jets conducting the air-policing mission and additional land weaponry. Lithuania's Armed Forces currently only have short-range anti-aircraft systems and has decided to buy Norwegian medium-range systems NASAMS. A ccording to earlier reports, they should be handed over by 2020 for just over 100 million euros. Lithuanian and foreign officers thought about future stationing of long-range defence systems Patriot, which can shoot down aircraft and ballistic missiles, however, no decisions have yet been made. In her interview to BNS, Grybauskaitė refused to specify military measures for reinforcing the Baltic air defense. The Lithuanian president said the meeting also addressed the Alliance's reform to speed up the decision-making process. "It is necessary for the decision-making process to be faster, reforms are needed in this area," she told BNS. Officials of Lithuania and other countries in the region have called for more powers to NATO's Supreme Allied Commander Europe ( SACEUR). The proposals are based on fears that decision-making in the council, which includes representatives of all member-states, could take too long in case of crisis. Grybauskaite expressed certitude that the decisions could be taken during the NATO summit in Brussels later this year. After the meeting, Pence said in his Twitter feed that he reassured the Baltic presidents "of US commitment to their security & our partnership." The US vice-president met with the three Baltic leaders amid fears in Europe about the new US President Donald Trump's foreign policies and stance on Russia. During a visit in Europe this week, high-ranking US officials said Washington would support the trans-Atlantic Alliance, at the same time restating their calls upon European Allies to boost their defense budgets. Grybauskaitė said the call from Washington was fair. "The United States have a full right of demanding that Europeans should themselves spend more on defense and also invest more in their defense," said the president. "They restated that they do not refuse solidarity, help or take their share of responsibility for world and European security. But we understand well that, with the new threats and increased activity of Russian actions along our border – we see how much Russia invests in its army and how aggressive its behavior is – I believe it would be entirely irresponsible to avoid responsibility for our own security and investment in our own security. It would be a big mistake for us all, which would be never be justified historically," the Lithuanian president told BNS.